Habit: Perennial herb, sometimes flowering 1st year or annual, +- leafy; +- glabrous to silvery-strigose. Leaf: 1--15 cm; leaflets generally 11--27(29), linear to widely +- ovate. Inflorescence: flowers 3-- +- 50, ascending or spreading. Flower: petals +- purple, cream, +- white, or mixed +- purple and +- white, keel 0.65--0.8 × banner, banner recurved 30--50°. Fruit: variable but generally ovate or spheric, widely grooved above and below, generally +- bladdery, +- papery, deciduous; stalk-like base 0; beak generally triangular, flat; chambers 2 below beak. Chromosomes: 2n=22. Note: Highly variable; varieties often distinct, yet intermediates are common; flower, fruit both needed for identification. Habit: Annual, occasionally perennial herb, +- densely silvery-hairy. Stem: ascending, 1--3 dm. Leaf: 6--16 cm; leaflets 7--19, 4--21 mm, +- obovate. Inflorescence: flowers 13--50; axis in fruit 4.5--26 cm. Flower: petals pink-purple, banner 12--14.8 mm, keel 10--13 mm. Fruit: erect to ascending, 15--23 mm, 4.5--6 mm wide, swollen, not bladdery, lanceolate or narrowly ovate, gently incurved in side view, papery, silky-hairy; upper suture concave, tapered to short, +- triangular, tooth-like beak. 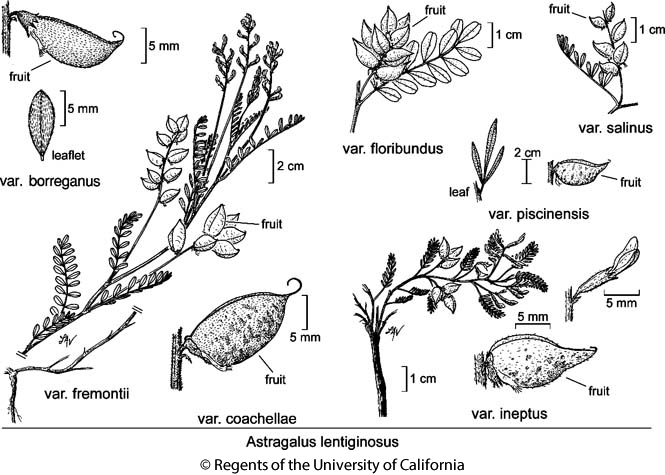 Citation for this treatment: Martin F. Wojciechowski & Richard Spellenberg 2012, Astragalus lentiginosus var. borreganus, in Jepson Flora Project (eds.) Jepson eFlora, http://ucjeps.berkeley.edu/eflora/eflora_display.php?tid=54782, accessed on April 24, 2019.